EveryLodge is a new startup that aims to at least partially fill the void left by the closure of sample sale aggregator MyNines last year. Like MyNines, EveryLodge also aggregates the ongoing flash sales from across the web for shoppers’ convenience. However, where the former focused on the fashion vertical, EveryLodge is instead focusing on aggregating the flash sales for hotel stays. To do so, the company has an interesting strategy to collect data which is often tucked away behind paywalls or the usernames and passwords required to access it. And it’s not letting the legalese surrounding many flash sale sites’ Terms of Service stand in the way. Explains founder Andrew Nicol, a former corporate lawyer in New York, the startup knows it can’t generally use bots or spiders to gather data from the sale websites like Jetsetter, Vacationist, Voyage Privé, and others, due to legal reasons. It also knows that in many cases, the sites’ Terms of Service prohibit its users from collecting or recording the data contained within, which is why EveryLodge says that, in those cases, it decided not even to join the site in question in order to track the details of the sales. “The flash sale websites don’t prohibit you from telling someone else about a sale they’re featuring. This is fortunate for us, but fortunate for them, too: without word of mouth publicity, they would probably go out of business,” says Nicol. Oh, so, scraping social media? Nicol notes that EveryLodge would ultimately like to reach an agreement to source its data directly from the sites it pulls from, but it has launched without those agreements in place. As a lawyer, he seems to be pretty confident that the data collection being performed is not either illegal or in violation of the companies’ Terms of Service. EveryLodge is currently tracking 14 sites: Bungolow, Expedia ASAP, Groupon Getaways, Jetsetter, LivingSocial, Luxury Link, SniqueAway, Spire, Tablet Hotels, Travesse, TripAlertz, Vacationist, Voyage Privé and Yuupon. It’s focused primarily on flash sales for now, and specifically those for hotels, resorts and other fixed-location venues. (Meaning, no cruises, tours, etc.). While many sites, including the above, provide details on discounted hotel rooms, EveryLodge is only interested in featuring those which are time-sensitive deep discounts. 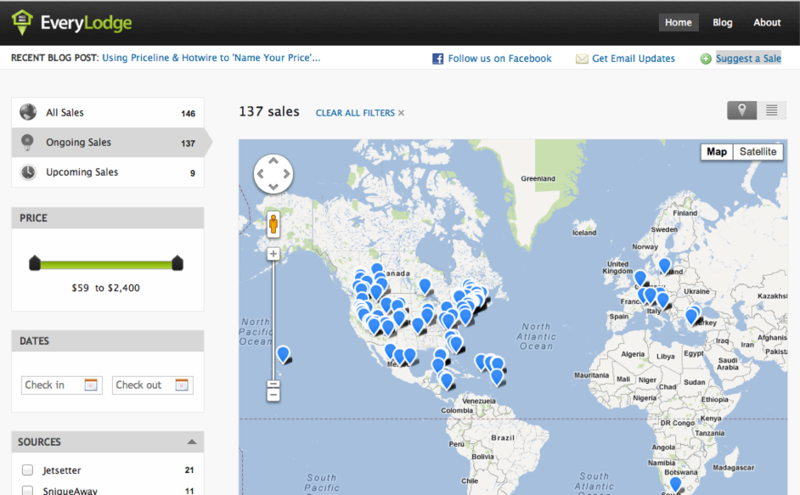 On the company’s homepage, these sales are plotted on a map, and can be filtered by status (ongoing or upcoming), price, check in and check out dates, and source. When a user is ready to book, they’re directed to the source of the sale itself. It’s unclear how the services being sourced will react to this launch – will they look upon EveryLodge as a helpful provider of referral traffic, or will they be upset that it’s managed to tap into some of their exclusive, private deals? EveryLodge was funded as a part of the Chilean Government’s Start-Up Chile Program, which offers entrepreneurs $40,000 is seed capital, but this project is actually an offshoot of a related project, also covering sales, which the company plans to launch later this fall.